A resistor is added to each of the red LED branches; this is to limit the current in those branches so that the white LED gets some current as well. Without the resistors, the bulk of the current will flow in the red LED branches (which have less resistance), and the white LED will not light as the current flow through it will be extremely small. Since the ship’s just held in place by wires, turning on and off a mechanical switch would eventually flex the ship out of shape. Hence a magnetic reed switch is used, it’s more streamlined and you can hide it in the fuselage without anything sticking out. Too cool! 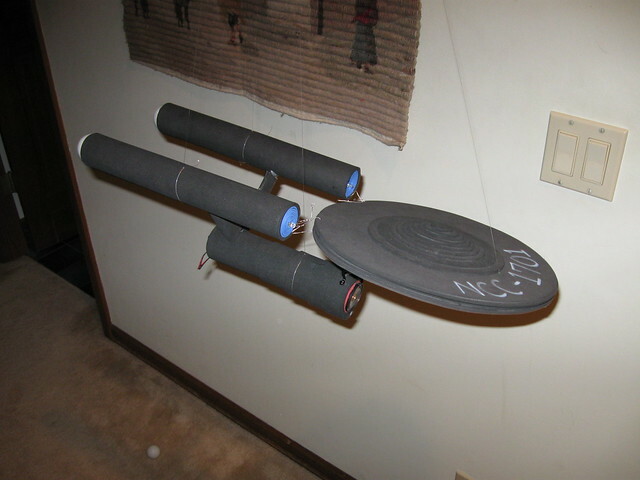 To boldly go where no LED has gone before…..
Oh wow!! Amazing!! I love it. Excellent post! I really enjoyed viewing your work. I will be back for more! Um @seth troisi, your Flickr site tells me that it is set to be private. That after insisting that I sign up for Flickr services. Despite that it happens to be a good idea. @Mr. Wolf, are you aware that at one point, the Enterprise was one of twelve such commissioned ships? Eventually they became the first twelve of many, complete with names as meaningful as the Enterprise is to most of us. superb basic idea , nice demostration for new learner , having no idea about reed switch, great . You’ll need a 3V cell, 3 resistors, 3 LEDs and a magnetic reed switch. There are a variety of ways of connecting up a 3 LED circuit, just search for a circuit that suits your needs. The magnetic reed switch takes the place of the usual switch in the circuit.